Volunteers Step Up to Help Track the Promises Made by Richmond’s Elected Officials | News and Features | Style Weekly - Richmond, VA local news, arts, and events. Scott Elmquist Melissa Vaughn (left) and Jessee Perry are the duo behind two local government accountability websites. Melissa Vaughn and Jessee Perry haven’t had a lot of shut-eye. But that doesn’t stop them from settling in to do what many would consider sleep-inducing on a recent Monday night. They’re at City Hall to watch, take notes and live-tweet the happenings at City Council. 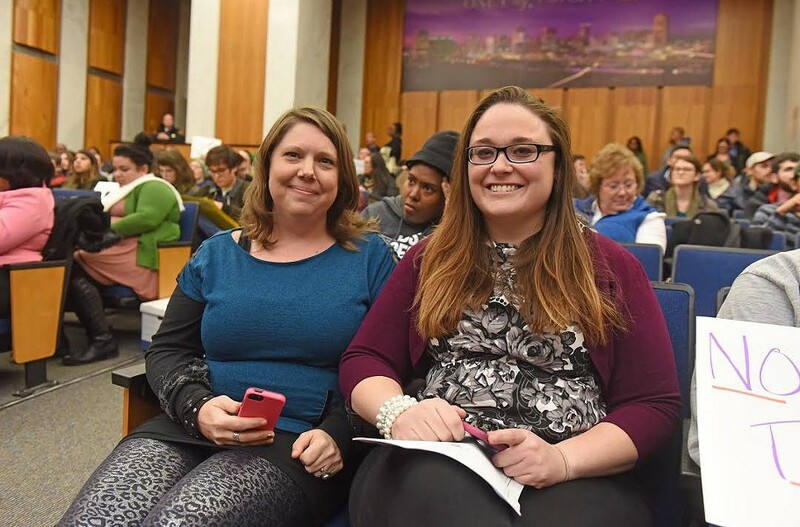 Later, they’ll watch the video archive of the Richmond School Board budget work session, which happens concurrently with council, and write it up -- all with as many gifs, memes and emojis as possible. She and Perry, 27, are the eyes, ears and smart phones behind RVADirt and Stoney Watch, two websites taking the act-locally directive to heart post-election. RVADirt.com plays host to a calendar of meetings, reports on local government and details on how to get involved. Its spinoff, StoneyWatch.com, is directed at Mayor Levar Stoney, aiming to hold him accountable for campaign promises he made. Perry and Vaughn, who are North Side residents, say they voted for Stoney after Jon Baliles dropped out. And they appreciate the transparency and openness of his administration compared with former Mayor Dwight Jones -- “a huge step in the right direction,” Vaughn says. But they aren’t planning to stand idly by, hoping he fulfills his pledges. Stoney Watch features graphics that track progress on the more quantifiable of Stoney’s goals, such as attending council meetings and visiting every city school. It lists others he made on 15 topics – including poverty and transit. A Stoney Sightings page posts his public schedule and photos of him out and about. The pair met last year through NextDoor, an application for neighborhood news and notices, when Perry volunteered to report back on a campaign event that Vaughn couldn’t attend. It was a match made in mayoral forum heaven, and soon they were in constant contact, tag-teaming the avalanche of election events. A shared distaste for campaign-sign violations helped seal the friendship. They each grew up in Chesterfield County and attended Manchester High School at different times. Perry, an insurance sales manager, ran an unsuccessful bid against incumbent Jeff Bourne for 3rd District School Board last year, and says she felt shut out of the conversation at times. Their voice includes a little snarkiness and a healthy dose of opinions, Perry says, which distinguishes them from traditional media outlets. There’s also the independence that adds a level of freedom. She and Vaughn can go to the meetings that most interest them and post views and analysis as they go, not worrying about opposing sources, deadlines, journalistic constraints -- or advertising. They estimate spending about 10 hours a week on the projects, including a City Council wrapup on WRIR-FM 97.3’s “Open Source RVA” that airs Fridays at 2 p.m. In the long run, the two hope to spread out the work across more volunteers -- from all nine city districts, they hope. But getting new residents to engage with their local representatives is motivation enough for now. Editor's note: The story has been updated to reflect the correct time of the council wrapup radio program on WRIR.